SANER2016 is now over! Thank you all for participating! See you in Klagenfurt, Austria, in 2017! 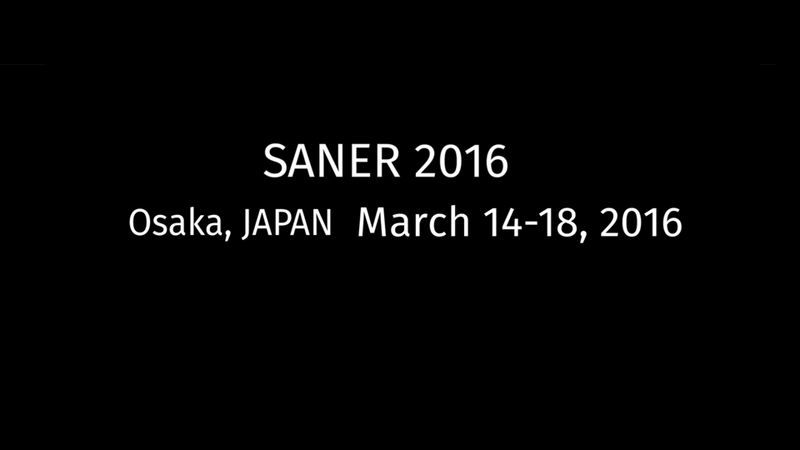 SANER 2016 will be held in Osaka from March 14 through 18, at Suita Campus in Osaka University, Japan. 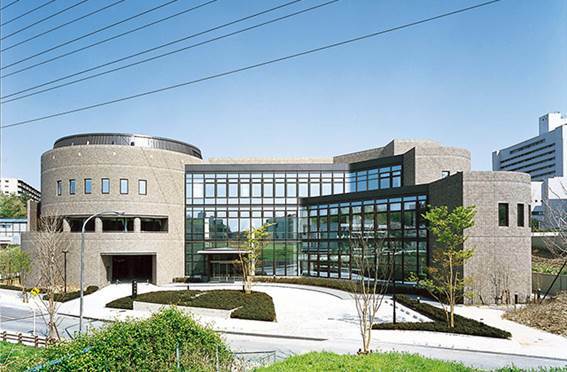 Osaka University, located in northern Osaka, is the largest national university in Japan with three campuses and more than 20,000 students. It is a leading research university with a strong software engineering research group with more than 40 faculty members, researchers, and graduate students. Osaka is a designated city in the Kansai region of Japan. It is the capital city of Osaka Prefecture and the largest component of the Keihanshin Metropolitan Area, the second largest metropolitan area in Japan and among the largest in the world with nearly 19 million inhabitants. Situated at the mouth of the Yodo River on Osaka Bay, Osaka is Japan's third largest city by population after the Tokyo 23 wards and Yokohama, and serves as a major economic hub. 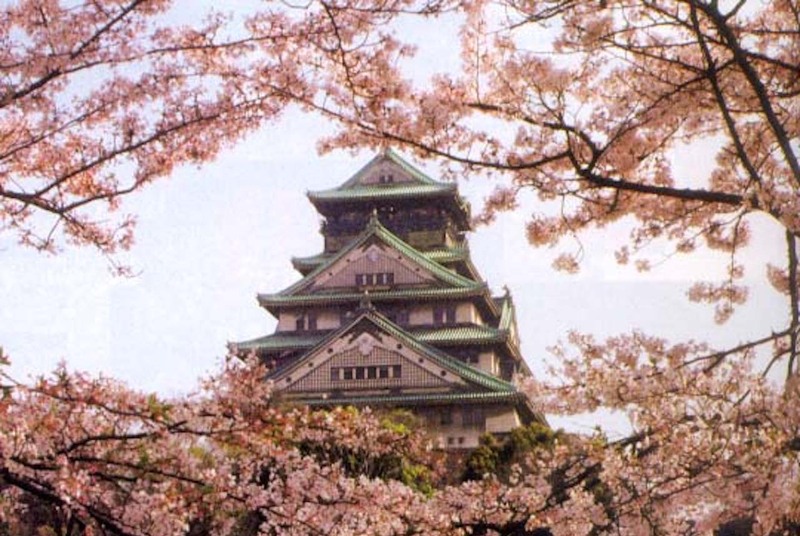 Osaka is a commercial city that started blossoming from the 15th century onwards. Currently, Osaka is the third largest prefecture in Japan with a population of 8.8 million, and it is an international hub of world trade. There are a lot of interesting and attractive spots to visit and enjoy. Moreover, UNESCO's world heritage sites in Kyoto and Nara are only one hour away by local train. Visitors can also expect to marvel at the world-famous cherry trees blooming by the end of March. 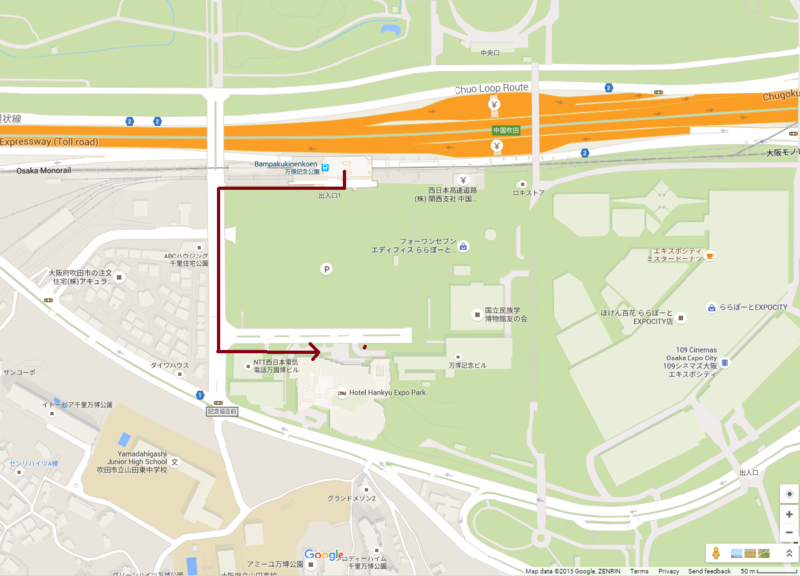 Access to Osaka University (Suita campus): We are located at a very convenient place in Japan. 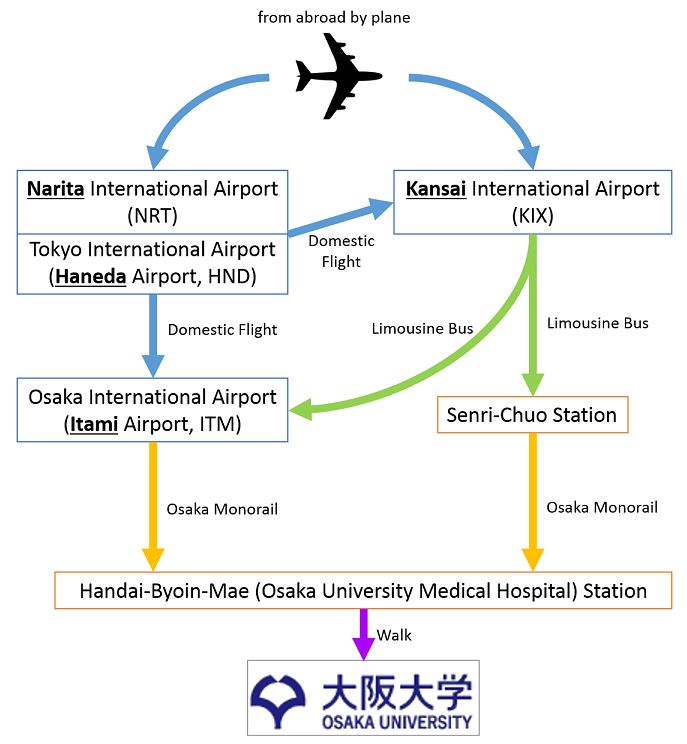 Osaka has two major international airports connecting various cities. 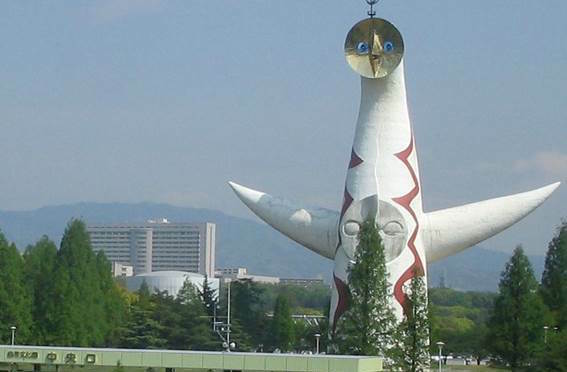 Kansai International Airport (KIX) is located in the southern part of Osaka, and has direct connections to Europe, North America, Asia, Middle East, Pacific, and so on. Osaka International Airport (Itami ITM) is located in the northern part of Osaka, and it provides many domestic flights to various cities in Japan, including Tokyo International Airport (Haneda HND) and New Tokyo International Airport (Narita NRT) where many international flights are available. It takes about 2 hours to reach the venue from KIX by train and monorail. From ITM, a monorail ride of half an hour suffices to reach the venue. The most convenient way to reach the venue from KIX is to take a limousine bus to ITM and continue from there by Osaka Monorail. Travel Around: Osaka University is located near the EXPOCITY, one of the largest shopping mall in Japan. You can enjoy Japanese food and do some shopping in some famous shops like Sanrio GIFTGATE, and Pokémon EXPO GYM. If you have some time to spend, you should visit the Osaka city center, enjoy the Osaka castle, it's park and museum, or attend the Japan Grand SUMO Tournament (it's scheduled on Mar.13 - 27 in 2016). SUMO is usually held in Tokyo but the Spring season is held in Osaka, during SANER this year. Moreover, Japanese traditional cities like Nara and Kyoto are only one hour far by train. There are many temples and shrines, and there are also some Japanese guest houses "Ryokan". Kobe is another famous city in the Kansai area, which has been affected by foreign cultures. Last but not least, if you want to visi Kansai, the Shin-Osaka bullet train station can be reached from the venue in 45 minutes by local train. From there, one can easily reach the rest of Japan, including Tokyo and Hiroshima, or take a domestic flight from ITM/KIX. There are two main conference hotels for SANER2016. One is Senri Hankyu Hotel, located in the Senri-Chuo area, and the other is Hotel Hankyu Expo Park in the Expo Park area..
Senri-Hankyu Hotel: Access from ITM (Osaka/Itami International Airport): There is easy access from the airport to the hotel via the Osaka Monorail. All monorail trains from Osaka Airport (station #11) stop at Senri-Chuo (station #15). The fair is 330JPY and it takes 12 min. After getting out of the monorail station, you will immediately make right turn, following the monorail side walk. So you will see the hotel in front of you. It takes just a few minutes. There is a limousine bus to ITM (Osaka International Airport) and continue from there by Osaka Monorail to Senri-Chuo (see above). The bus from KIX to ITM departs almost every 30 min. It takes 75 min. and the fair is 1,950JPY. The same limousine service has a bus to Senri Chuo (it is less frequent. It departs only 8:45PM and 9:45PM at Terminal 1). It will leave you at few hundred meters north from the hotel. It takes one and half hours and the fair is 1,950JPY. Hotel Hankyu Expo Park: Access from ITM (Osaka/Itami International Airport): There is easy access from the airport to the hotel via the Osaka Monorail. All monorail trains from Osaka Airport stop at Banpaku-Kinen-Koen (Expo’70 Commemoration Park, station #17). The fair is 370JPY and it takes 18 min. After getting out of the monorail station, you will see the hotel right in front. It takes just a few minutes to walk to it. Access from KIX (Kansai International Airport): There are two alternatives to reach the hotel from this airport using the bus service. Take the limousine bus to ITM (Osaka International Airport) and continue from there by Osaka Monorail to Banpaku-Kinen-Koen (Expo’70 Commemoration Park, see above). The bus from KIX to ITM departs almost every 30 min. It takes 75 min. and the fair is 1,950JPY. The same limousine service has a bus to Senri Chuo (it is less frequent. It departs only 8:45PM and 9:45PM at Terminal 1. 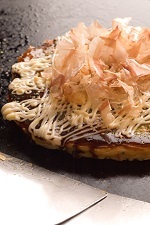 It will leave you at few hundred meters north east from the monorail station. The bus takes one and half hours and the fair is 1,950JPY. From Senri Chuo take the Osaka Monorail to Banpaku-Kinen-Koen (Expo’70 Commemoration Park). It takes 5 min. and the fair is 250JPY. From Senri-Hankyu Hotel: At Senri-Chuo Station take the Osaka Monorail heading towards Saito-Nishi Station, and get off at Handai-Byoin-Mae (Osaka University Medical Hospital, station #52). It costs 290JPY and takes approximately about 10 min. Note that between 10AM and 5:30PM, there is no direct train going towards Saito-Nishi Station; instead you have to take the train towards Kadoma-Shi Station, and change trains at Banpaku-Kinen-Koen (Expo’70 Commemoration Park). At the exit of the Handai-Byoin-Mae (Osaka University Medical Hospital) station, you will see and follow the signs for SANER2016. From Hotel Hankyu Expo Park: At Banpaku-Kinen-Koen Station (Expo’70 Commemoration Park) take a monorail heading towards Saito-Nishi Station, and get off at Handai-Byoin-Mae (Osaka University Medical Hospital). It takes 250JPY and about 5 min. After exiting the station, you will see and follow the signs for SANER2016. There are several ways to get it. Please note that almost all ticket machines in Japan do not accept credit cards. You need to prepare cash. Single-trip Ticket: Determine the price of your trip. You will see signs on top of the machines that state what the cost of the fair is (this price depends on the destination). Ticketing machine: Put enough money (use coins bigger or equal to 10 yen or use bills) in the ticketing machine. Once you put enough money you will see the different fares appear. Press the one you want. The machine will output a ticket and change. Insert the ticket in the entrance machine. There is a slot on the right hand side. Tickets can only be used from the station they are bought. The machine will return you the ticket. Keep this ticket. When you exit, as when you entered, insert the ticket in the machine. The machine will not return you the ticket. If you need a receipt. Instead of using the machine to exit the station, ask the attendant to stamp your receipt: show her/him the ticket, mimic the motion of stamping the ticket, and say: “receipt, o kudasai”. She/he will verify the fare you paid, stamp the receipt and let you exit. 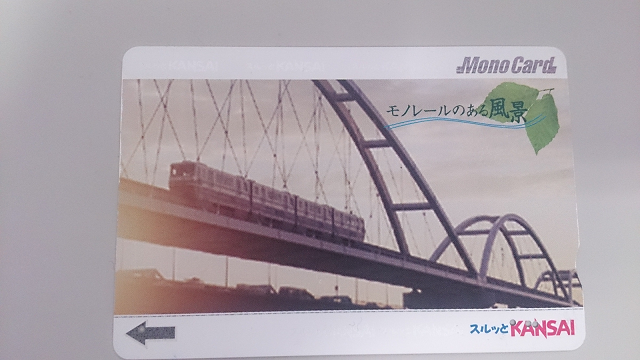 Prepaid Card: You can buy a prepaid card named Monorail Card (or sometimes called Kansai Thru Pass), with a prepaid amount of 1,000, 2,000, or 3,000JPY. You can buy them at the ticket machines of the monorail. This prepaid card can be used by in other trains and the subway, but it cannot be used in JR lines. 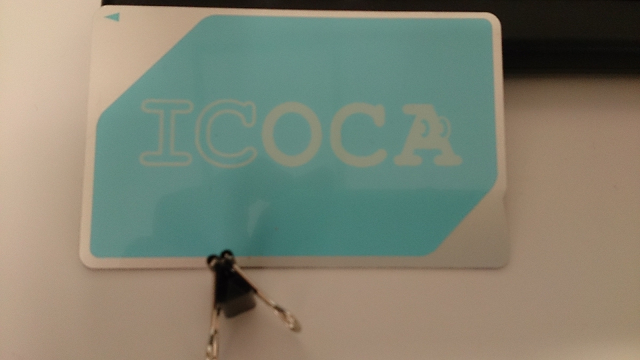 If you have a chance to go to any JR station, you can buy an IC card named ICOCA, which is a rechargeable prepaid pass, and can be used in lieu of money in many places (eg. transportation, convenience stores, and vending machines). It can be used with any subway or train line in Japan (including JR and Monorail). It is sold at prices of 1,000, 2,000, 5,000, and 1,0000JPY including a 500JPY deposit which will be refundable at JR stations. Another advantage is that in JR ticketing machines you can get a listing of expenses paid with that card. This is the most convenient way of payment for transportation in Japan. 1. Touch the sensor in the entrance machine of the train station. You will see your balance displayed in the machine. 2. When exiting the station, touch the sensor as when you entered. You will see your new balance displayed. 3. If your balance is not enough, the machine will not let you exit. There are machines inside the stations where you can top-up your card. These are named Fare Adjustment. There is always at least one in each station. 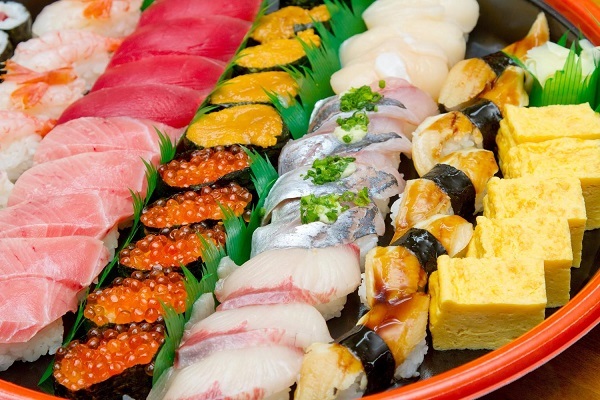 Umeda and Namba are big spots for food, drinking, shopping, and sightseeing. From Osaka University, take a Monorail to Senri-Chuo, and change to the Kita-Osaka Kyuko Line (directly connected to Subway Midosuji Line) to the South. From Senri-Chuo (station M08) it takes approximately 20 min. to Umeda (station M16) and 30 min. to Namba (station M20). Note that there is no transfer system between transportation methods in Osaka. You need to pay separately for the Monorail and the Subway. Tickets of the Subway are sold in machines similar to those of the Monorail. Prepaid cards work with the Subway too. From the conference venue and conference hotels it takes approximately 1 hr to go to Kyoto (Gion area). From Osaka University, take the Monorail to Minami-Ibaraki Station (station 19, via Banpaku-Kinen-Koen/Expo’70 Commemoration Park). Exit the monorail and change to the Hankyu Line heading to Kyoto (Kawaramachi station, station HK86). You may change Hankyu trains at Ibaraki-Shi Station (station HK69, next to Minami-Ibaraki Station), and take a Limited Express train that makes less stops (with no extra charge). This will lead you to the final destination Kawaramachi Station in Kyoto, where you can easily walk to Gion area and many other tourist spots. Note that the Bullet Train can be used to go to Kyoto, but it requires a detour, arrives in a less touristic area of Kyoto, costs more, and most likely takes more time to arrive to Gion than taking the Monorail and the Hankyu line. From Osaka University, you will take the Monorail to Senri-Chuo Station, and get the Kita-Osaka Kyuko Line (directly connected to Subway Midosuji Line) to Shin-Osaka Station (station M13, 13 min from Senri Chuo). From Shin-Osaka Station, the bullet train, Shinkansen, departs every 10~20 min., and takes about two and half hours to go to Tokyo. You will go to the ticket office and ask the proper tickets for Shinkansen, which are composed of the basic ticket and limited express ticket. Shin-Osaka Station is about 3 min. ride from Osaka Station by JR line or about 6 min. ride from Umeda Station by Subway Midosuji Line. Remember to keep the tickets and use them when you exit the station. Public transportion in the Osaka region (including Kyoto) ends around midnight. After that time the only option is to use taxis. As of Feb 24, there is no Uber service in Osaka. Taxi from Umeda to Senri-Chuo costs about 4,000JPY during day and evening, and 5,000JYP from 10PM to 5AM. 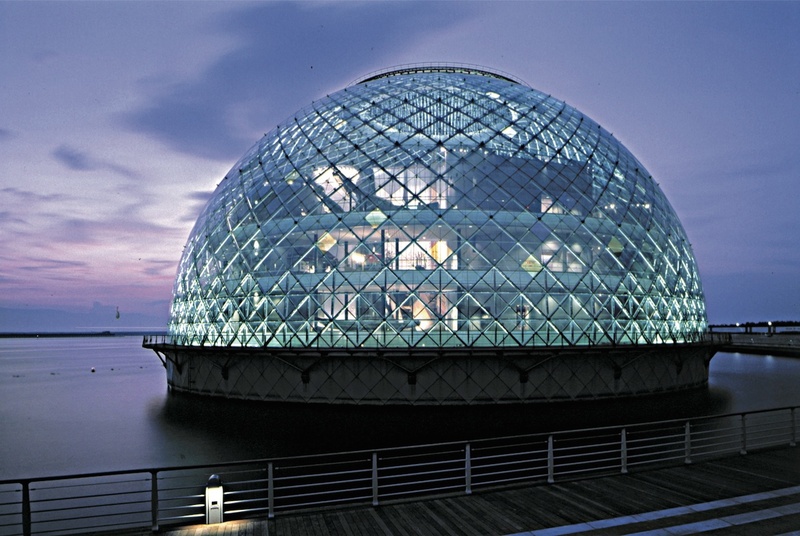 To go to Expo Park, it would cost an additional 1,500JPY. Walking from Umeda to Senri-Chuo would take more than 3 hours and it is not recommended at all. Please enjoy trips in Japan! 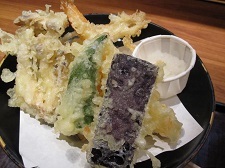 Many of you probably know that Japan is famed for Japanese-style food such as SUSHI and TEMPURA. 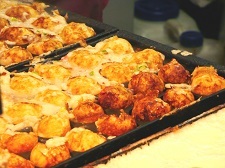 In addition to such foods, you can enjoy some local foods such as TAKOYAKI and OKONOMIYAKI in Osaka. 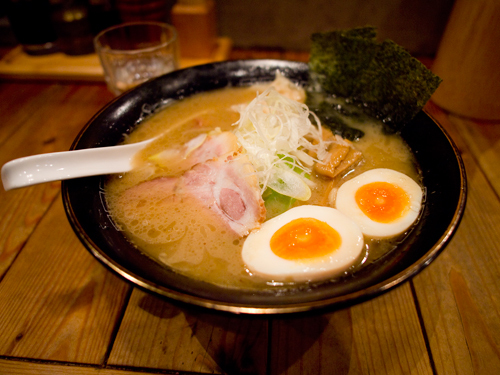 Besides, SANER2016 organization team recommends you to experience RAMEN, which is a Japanese-style noodle. Visa Information: There are many countries whose citizens do not require visa for Japan. Please check here. We will send you the documents needed for your visa application at your local Japanese embassy or consulate. The registration system is now open. The system firstly creates an account for your registration. Using the account, you can modify your registration and make a hotel reservation. You can register for SANER, FoSE, and four workshops (VST/IWSC/PPAP/OOPSLE) on the system. IWESEP 2016 has an independent registration. The system supports your hotel reservation. 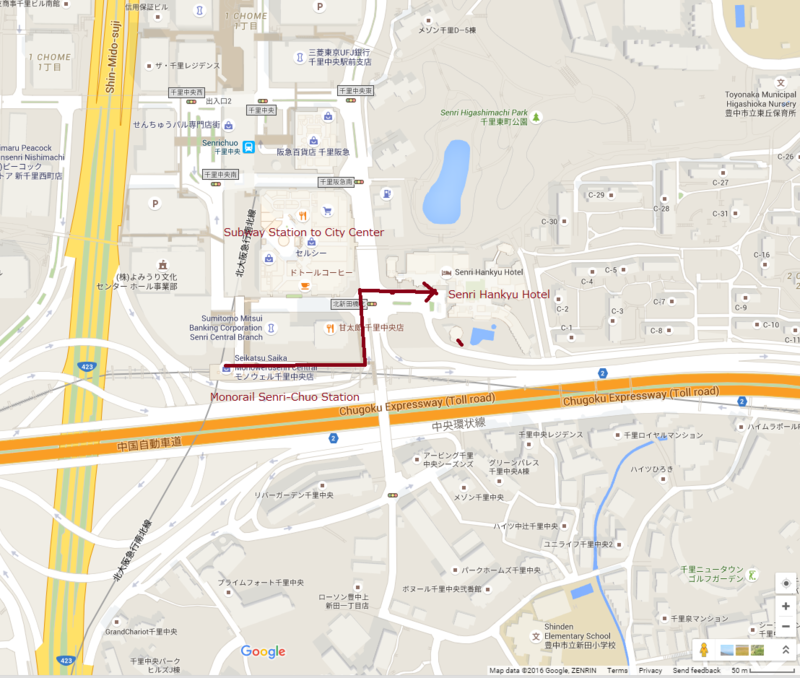 We offer Senri Hankyu Hotel and Hotel Hankyu Expo Park. The hotels are located nearby Osaka Monorail stations. To get Osaka University (Handai-byoin-mae station), it takes 11 minutes from Senri Hankyu Hotel (Senri-chuo station) and 5 minutes from Hotel Hankyu Expo Park (Bampaku-kinen-koen station), respectively. You should make your hotel reservation as soon as possible, because March is high season. JTB, the travel agency operating the registration system, will help your accommodation if you have any questions and requests. Please complete the payment to guarantee your registration and accommodation. A receipt for your registration fee is separately issued from the accommodation fee. The receipts will be available at the registration desk on site. †Students are requested to bring their student ID issued by their affiliation.